Montblanc's latest perpetual calendar offering is perhaps one of the best value propositions on the market these days. Not only are its aesthetics charming and elegant, with a hint of vintage appeal, it is also equipped with an excellent new MB 29.22 movement made in-house by its Minerva manufacture (which parent company Richemont Group had purchased and accorded to Montblanc in 2004). The layout of the new Heritage Perpetual Calendar is also much more well-spaced than the Meisterstuck Heritage Perpetual Calendar from 2014, its previous in-house perpetual calendar offering. This indicates that much care was taken in the creation of this new piece, with movement creators and aesthetics designers working in beautiful unison. The attention to detail is light blue and gold detailing on the dial also make for a pleasing colour combination. Plus, a second time zone function has also been added on, in the form of the skeletonised hour hand. It also sits well on the wrist, measuring in at 40mm in diameter and 12.3mm thick—relatively slim for a perpetual calendar with a modular construction, even including the domed sapphire crystal. IWC is doubling down on its in-house manufacturing expertise. 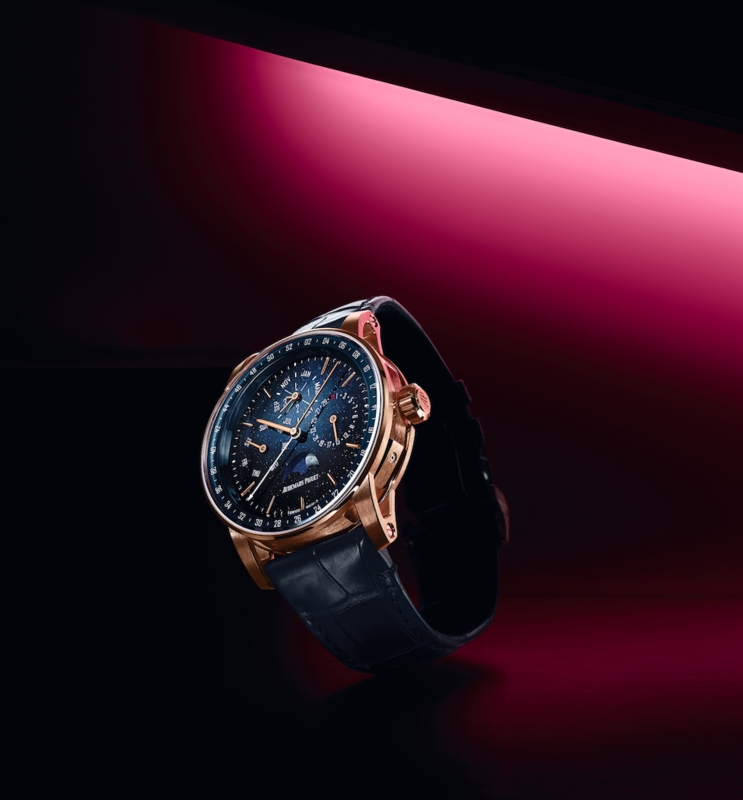 Thanks to the new IWC Manufakurzentrum that it opened on the outskirts of Schaffhausen last year, IWC is now able to increase its production of in-house movements; as of 2019, all of the movements in the Spitfire sub-collection are made in-house, including this Big Pilot's Watch Perpetual Calendar Spitfire. Like all of IWC's in-house movements, the 52615 calibre is robust, with features such as a long seven-day power reserve (made possible by two barrels) and a winding mechanism that is made of wear-resistant ceramic. The movement incorporates the perpetual calendar module developed by IWC's legendary watchmaker Kurt Klaus, who turns 85 this year. On top of the perpetual calendar function, the Big Pilot's Watch Perpetual Calendar Spitfire also has a double moon display that shows the moon in the correct position in the northern and southern hemisphere and will only need adjusting every 577.5 years. The case of the watch is crafted from bronze—a trendy material of late—and is offset with a green dial and white detailing. Bronze will develop a special patina over time, but to ensure that the material does not react with the wearer's skin, the caseback is made from titanium and sapphire crystal—the latter material also means that you can see the exceptional movement up close. This watch is perhaps the most useful iteration of the perpetual calendar we've seen to date. One of the greatest pitfalls of perpetual calendars is that they must be kept constantly wound if they are to keep to their promise of only needing adjustment once every few hundred years. Given that many such watches have relatively small power reserves of less than two days, that proposition is quite tough indeed. To tackle this problem, brands can add a second barrel to increase the power reserve (as with IWC above), or, as Vacheron Constantin have done with the Traditionnelle Twin Beat Perpetual Calendar, come up with an entirely novel solution. The Traditionnelle Twin Beat Perpetual Calendar has two modes: active mode and standby mode, and the wearer can choose which mode the watch operates in. The difference between these two modes are the oscillation frequencies of the two balance wheels in the escapement—hence the name Twin Beat. One of these balance wheels oscillates at a quick 5Hz (for active mode), and the other oscillates at a slow 1.2Hz (for standby mode). When on the wrist, the wearer should choose to keep the watch on active mode—since the higher oscillation means a greater level of precision—and enjoy some 4 days of power reserve. When in storage, however, the owner can switch the watch to standby mode; the slower oscillation preserves the power reserve and allows the watch to continue ticking for at least 65 days. At any point during that time, the watch can be picked up again, and switched back to active mode with all of its calendar indications up to date. How's that for perpetual calendar? Audemars Piguet is possibly the hottest subject of debate right now, thanks to its launch of its new Code 11.59 collection. Some appreciate the meticulous attention to details, particularly on the case, while others lament the design of the dials. Whatever you think of the new collection, however, it cannot be denied that Audemars Piguet makes both excellent watches and excellent perpetual calendars. It is the creator of the world's thinnest perpetual calendar, after all. While that particular watch, the Royal Oak RD#2, was a concept watch that never went into production, its proof of the brand's prowess is undeniable. The new Code 11.59 houses the in-house calibre 5134, which is still incredibly slim at 4.31mm thick, and includes an astronomical moon display that requires adjustment once every 122 years and 108 days. This dial is also perhaps the most beautiful of the new Code 11.59 launches. It's made of sparkling aventurine glass, a material created by chance on the island of Murano in the 17th century. Last year, Baume & Mercier hit a milestone, creating its first in-house manufacture movement. This year, it has topped said movement with a perpetual calendar module made by Dubois-Depraz to create the Clifton Baumatic Perpetual Calendar. The watch is also a value proposition for those looking for an entry-level perpetual calendar (if there even is such a thing). Its in-house baumatic BM13-1975AC-1 movement has an impressive 7 days of power reserve, and sports a silicon hairspring that imparts anti-magnetic properties to the movement, meaning that the movement will be more precise than movements with a normal hairspring. The incredibly long name of this watch exists for a reason: On top of the perpetual calendar it also has a Westminster carillon minute repeater with crystal gongs, a multi-axis tourbillon that has been downsized for greater wearability, and a constant-force mechanism. Needless to say, this is an incredible mechanical achievement from Jaeger-LeCoultre. The Westminster carillon minute repeater chimes the famous melody of the Big Ben clock at the Palace of Westminster in London.The Master Grande Tradition Gyrotourbillon Westminster Perpétuel uses four sets of gongs and hammers to chime the time when the minute repeater is activated, with the longest chime at 12:59 measuring 28s long. Such a minute repeater is among the most complex of its kind, and requires a high level of watchmaking know-how. Jaeger-LeCoultre has been known for its multi-axis tourbillons—which it calls gyrotourbillons—for years now, with the first emerging in 2004. This particular specimen is the fifth that the brand has produced, and has been downsized from the previous smallest gyrotourbillon by an estimated 15 per cent (although that had been a flying gyrotourbillon, so a direct comparison is somewhat discouraged). While this may not seem impressive at first, consider that the shrinkage involves much smaller tolerances and greater need for precision in engineering, while maintaining chronometric precision. All of this so that the rest of the complications can fit into the 43mm by 14.08mm case, and still be wearable. Part of the precision is achieved by the constant force mechanism, which helps to provide a consistent level of power to the tourbillon without affecting its accuracy and precision. In the Master Grande Tradition Gyrotourbillon Westminster Perpétuel, the constant force mechanism also conveys an additional advantage by regulating the minute wheel, resulting in a jumping minutes hand that offers greater precision in time display. This also cancels out the error that may occur when a minute repeater is activated between two different minutes. Finally, the perpetual calendar indication also has a new innovation—for the first time for Jaeger-LeCoultre, the perpetual calendar can be set either forwards or backwards, unlike other such complications, which can only be set forwards.